Choice of timber: typically ripple sycamore for the back, ribs, neck and fingerboard; spruce for soundboard (not grown locally) and boxwood or fruit-wood pegs, but clients may specify other woods. Should a repair ever be necessary in the future, this is simplified by the use of animal glue in making these instruments. Strings are all gut. George Stoppani Real Guts or similar as standard for the lower strings. Finish: Oil-varnished to a rich golden colour to bring out the natural beauty of the wood. These are based on the typical bow which appears in paintings throughout the 16th and 17th centuries. 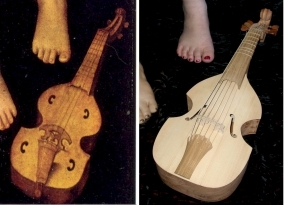 They have a clip in frog and work particularly well with the Linarol viols, but are well suited to all types of viol up to the 18th century. This type of bow, rather than one adjusted by a screw-fitting, was the typical bow for stringed instruments from around 1500—1700. 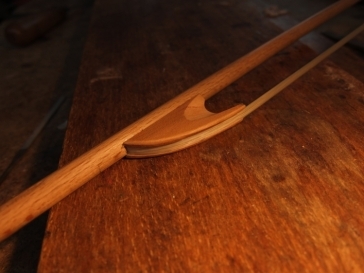 My bows are made mainly from beech, which is less dense than pernambuco, but there are sometimes larch, oak or green-heart bows available in a variety of lengths and weights. More details available on request. Hair length : 600 –670 mm Weight : 30 –75 gms. 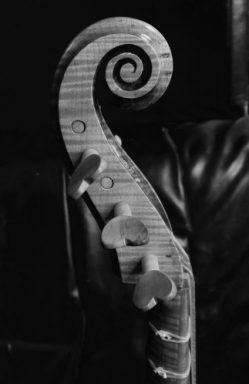 Cases : I can provide well padded, soft cases for your viol or Kingham hard cases - in both instances, custom designed and made for the instrument.